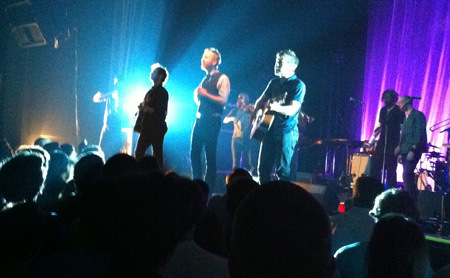 I’m still on a bit of a high after seeing The National last week in Tucson and Tempe on back-to-back nights. So this new video, which serves more or less as a mini tour documentary set to an alternate version of the song Terrible Love, is already making me nostalgic for seven days ago. Listening to Terrible Love on record, I’d never guess it would replace Mr. November as the epic, walk-through-the-audience moment of the encore. And, yet, it worked (even if the unwieldy mic cord whacked me in the neck in Tempe). I love this video, which humanizes the band and loosens the tie a little on singer Matt Berninger’s ever-serious demeanor. This alternate version can be found on the expanded edition of High Violet, which includes a bonus disc of unreleased songs, live tracks B-sides, etc. You know the drill: Buy album once and buy it again. It’s due out Nov. 22. "Prague... you'll come back a bug." "Prague… you'll come back a bug."